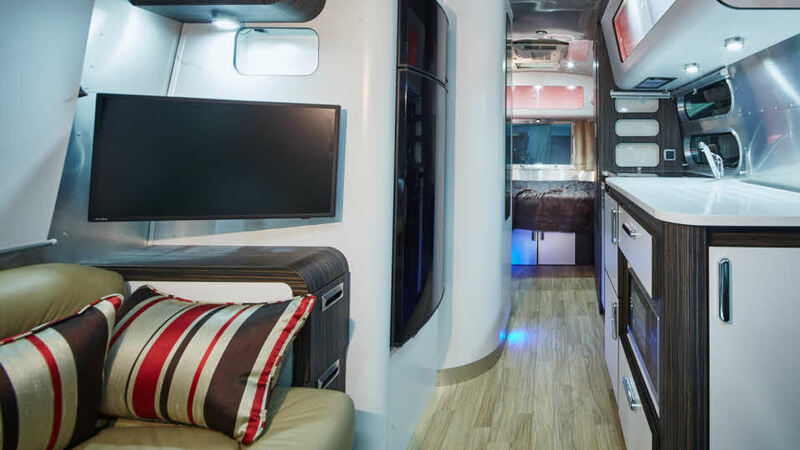 The way we watch television has changed dramatically in recent years: from the types of screen that we use to the way the signal gets to the screen – and these changes are equally applicable to television viewing in a caravan. Technological breakthroughs like satellite broadcasting, Freeview and digital hard drive recording mean caravanners can watch virtually the same television programmes with the same quality of picture and sound that they get at home. In the UK DVB-T is widely available to most of the population. This is the easiest and cheapest way for most people to receive digital television and the Freeview service offers dozens of television channels and radio stations. The best way of receiving digital television signals is to use a directional aerial – the same sort that you would have at home. As with omni-directional aerials, a directional should be mounted as high as possible. A pole can be fixed to a jockey wheel, the ladder on a motorhome or to brackets which can be permanently attached to the vehicle and into which a pole can be mounted. Telescopic poles are available which can be extended to almost 12" but collapse down to a manageable 4" for storage. It is recommended that you have a 25-metre length of 7mm-diameter 75ohm television coaxial cable with a standard male coaxial plug at each end. A DVB-T receiver or set top box is essential for reception of digital television via an aerial. You cannot use a satellite receiver with a terrestrial set-up and vice versa. As with an analogue television, a digital receiver has to be re-tuned every time the location where it is being used changes. As long as the aerial is receiving signals, this is a simple task and should not take you more than a few minutes. Some receivers are available with a built-in hard-drive recorder. These units are usually called PVRs (Personal Video Recorders) or DVRs (Digital Video Recorders). Amongst other features, they enable the viewer to watch one channel while recording another and to store many hours of programming on the hard drive. More and more televisions are being manufactured with DVB-T receivers built in and this removes the necessity for an external set-top box. Receiving digital television by satellite has some significant advantages over terrestrial reception. For those who are travelling out in the wilds of Great Britain & Ireland, where terrestrial television signals are weak – if available at all – satellite is the best choice. And, for people who want to watch British programmes when they are abroad, satellite is the only available option. With a satellite dish and receiver, you can receive hundreds of television and radio stations absolutely free of charge. These include all BBC television and radio stations, all ITV stations, SKY News, CNN, Film 4 and many others on “Freesat”. Televisions with built in Freesat receivers are also on sale. Freesat makes satellite reception very attractive indeed for people who want satellite TV but do not want to subscribe to Sky. Which satellite dish will I need? Portable systems are the cheapest type and can be small enough to easily be stowed away when not in use. They can be set up on a tripod or a pole or simply placed on a table or even on the ground. Dishes are available in sizes from 30cm – 100cm in diameter. Standard domestic satellite dishes can be used but, for most people, their size, weight and design make them a lot less convenient to carry and much trickier to set up than a purpose-made portable dish. Which size dish will be best depends entirely on where it is going to be used. In the UK and Ireland a 50cm dish will be adequate to receive all channels. If you want to watch BBC or ITV in Spain, however, you need to consider a larger model. It is possible to line up a satellite dish using just a compass and watching the television screen. However, it is probably best to use a piece of equipment usually called a “satfinder” which is connected between the dish and the receiver. Such systems comprise a dish on the roof of the vehicle and a means of controlling its position from inside. This option avoids the possibility of having to set up a dish in the rain or the dark but still requires accurate alignment with the satellite. With the dish fixed, this should not be too difficult especially if a satfinder is used. For the ultimate in convenience, a fully automatic system is the answer. At the touch of a few buttons, all of them search for the appropriate satellite and, when they have found it, lock on. In order to watch satellite television transmissions you must have a satellite receiver. The Sky digibox is the best known in the UK and, if you want to receive Channels 4 and 5 or if you want to watch Sky’s subscription channels, you must use one, along with a viewing card. If you are content just to watch free-to-air channels, a Freesat box will be sufficient. Note: Sky viewing cards are electronically matched to the digiboxes in which they are used and cannot be moved from one digibox to another. If you want to use two digiboxes, one at home and one in your caravan for example, you will have to have two viewing cards if you want to watch any of the encrypted channels. This can be arranged through Sky. Also, bear in mind that the terms and conditions for use of the card state that it cannot be taken abroad. Even when away from home in your caravan or motorhome, internet access can be useful or even vital. A Wi-Fi “dongle” will enable you to connect via a laptop and, if reception is good, upload and download speeds can be just as good, if not better, than when using a normal; telephone line; but if there is no Wi-Fi signal you will have no access. Internet access systems are now available which can allow you to do just about everything in your caravan or motorhome that you would do at home or at work. Using satellites to receive and transfer data has the advantage of enabling the user to work anywhere within the satellite’s footprint – depending on local conditions and the size of the dish being used. Dedicated systems are usually mounted on a vehicle’s roof and provide communication to and from the satellite. Many sites (including some Club Sites) offer on-site Wi-Fi. While this is useful for general internet usage, it may not suit use with video-streaming services, Such as the BBC’s iPlayer. To watch video requires a high rate of data transmission. This is easy to deliver for one or two simultaneous users, but when 10 or 20 or more caravanners all want to watch at once, there is unlikely to be sufficient ‘bandwidth’ to support this. So do not rely on being able to watch television over such connections – you may well be disappointed. Unless you have a particularly large caravan and lots of power available, an LCD television will probably be best for you. They use less power than older types of television and can be much more convenient to move around and store. However, they are vulnerable to damage and, if the screen should suffer a knock, it could be permanently damaged. They can also be very sensitive to voltage fluctuations so are often used with a small voltage regulator to avoid problems. Models are available with built-in digital receivers, built-in DVD players and even with built-in card readers so that photos can be viewed on a big screen. When using a television abroad, what you can watch depends on what reception method you use. If you have a satellite system you will probably be able to receive some British channels. If you have an aerial and a DVB-T receiver you may be able to pick up some local programmes.